I had never seen bauxite before, this is the red ore mined and then refined to make alumina. Bauxite is the reason that this part of East Arnhem Land is open to tourists (with the necessary permits) as the giant Rio Tinto strip mine is located there, along with a refinery, although the latter seems destined to close due to the high costs of running it at such a remote site. A few km's walk south of Nhulunbuy, on the way to Yirrkala, the bauxite shelf meets the sea. 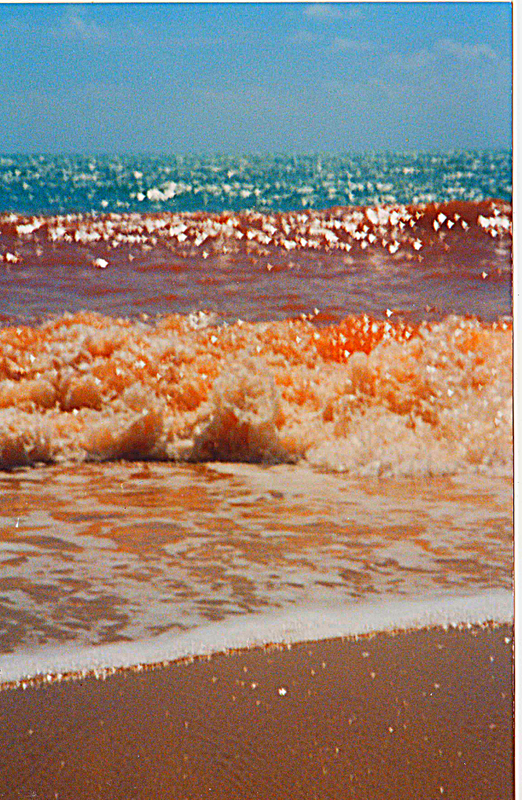 At high tide the waves crash in and disturb the bauxite, turning the water to a blood red colour. It is fascinating to watch, an unusual natural occurrence, and is not in any guidebook. Take care, as saltwater crocodiles do linger on the beaches here. Buku Larrngay Mulka Yirrkala Arts and Crafts Centre Some of the best Aborginal art from the Yolngu people who care for the land here. Beautiful bark paintings and wooden sculptures at reasonable prices, most gets shipped to galleries in Australia and overseas. Yirrkala itself is worth a visit anyway, friendly locals, and the site of an amazing Midnight Oil and Warumpi band concert on the Blackfella/Whitefella tour, described in detail in 'Strict Rules' by the sadly missed Andrew McMillan. Tour the Rio Tinto Mine and Refinery. Whether you support mining or not, the scale of the mine, and size of the trucks toiling over the red bauxite is an incredible site. With the refinery closing down, tours are uncertain, but call 08 8987 5355 to see if the Friday morning tour is running. Have a beer or two at sunset at the Gove Boat Club a great place to relax, and if you are lucky, to see the ever so strange spectacle of crocodiles swimming past in the ocean. Go on a 4WD trip to Cape Arnhem (Nanydjaka) and explore deserted beaches and basalt rock islands on the edge of the Arafura Sea. Great for snorkeling (with obvious precautions) and a picnic on the beach. Walk up to the Rotary Marika Lookout on Mount Saunders, in Nhulunbuy. This is a great viewpoint to see Gayngaru, the harbour, the mine, and the bush that surrounds and isolates the area. Go Fishing. You can fish from the shore, spearfish while snorkeling, hire your own tinny (aluminum boat) or go on a boat charter. The fish are plentiful, large, and so tasty. I caught a Snapper from the beach one day, and had an impromptu barbeque. If you time it right, mid August usually, visit the Garma Festival an internationally acclaimed cultural and music festival celebrating the Yolngu way of life. Take a day trip (or longer) to Elcho Island and see the natural beauty of the island where traditional ways of sustainable living continue, and see the beautiful local art. This is the island of George Burarrwanga of the Warumpi band, and inspired the alternative Australian national anthem 'My Island Home'.